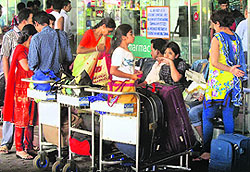 Fliers were left fretting as cancellations continued on Day 5 of the Air India pilots� stir today. The Army today moved its Artillery unit posted at Nyoma, Ladakh, back to its base and flew in two officers to take charge and coordinate the effort. A 226 Field Regiment unit witnessed an unprecedented clash among jawans and officers on May 10-11 in which the Commanding Officer was injured. In a decision which can have implications on the revival of Indo-Pak bilateral cricket ties, the BCCI today cleared the decks for the inclusion of a team from Pakistan in the Champions League Twenty20 for the first time since the event's inception. It�s a move that could obliterate many of Punjab�s woes. The Planning Commission has given an in-principle approval to a slew of schemes, which, once implemented, promise to usher in a much-needed change in the northern state. Activists of the Republican Party of India (RPI) allegedly ransacked the office of Suhas Palshikar in Pune today. He had resigned yesterday as advisor of the NCERT over the publication of a cartoon of BR Ambedkar in school textbooks. The Tribune regrets having wrongly mentioned in a report carried on May 9 that among the officers owning government land in the periphery of Chandigarh was senior serving IAS officer of Punjab, Mr Viswajeet Khanna. In fact, he does not own any such land. Twenty-six crew members, including 11 Indians, have been held captive by suspected Somali pirates after the hijacking of a Liberian-flagged crude tanker off the Omani coast, the Directorate General Shipping said today.